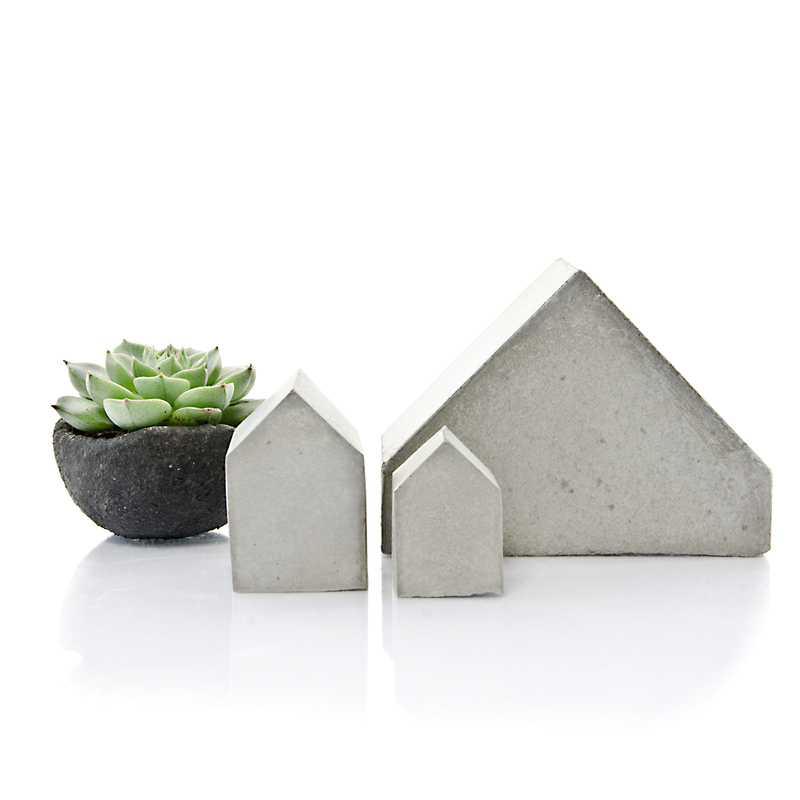 Concrete house sculpture set of two! A quirky set of two Scandinavian inspired houses to enjoy and give as a delightful surprise. 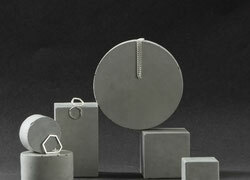 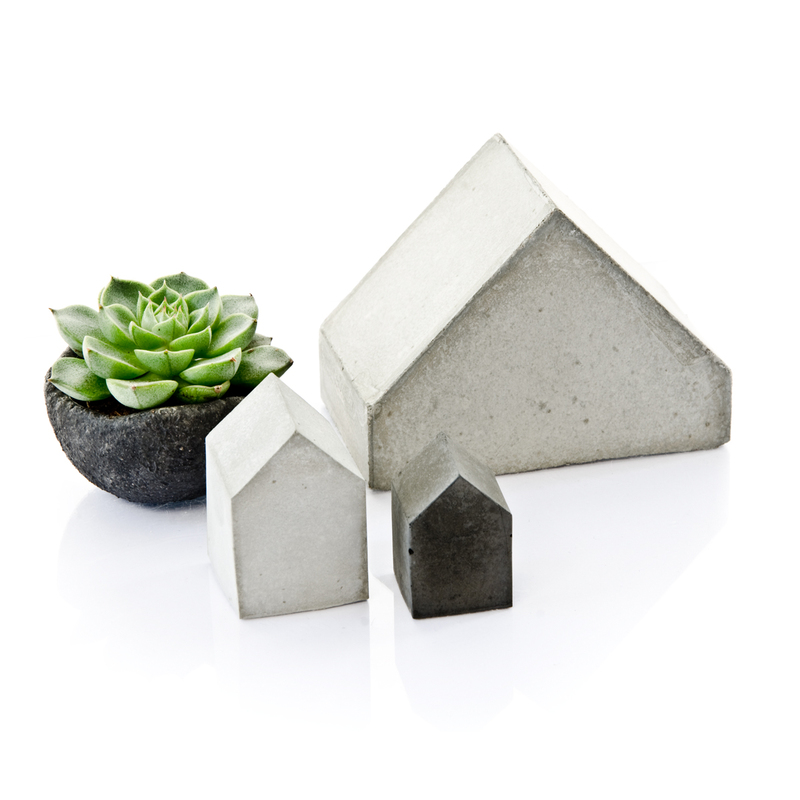 They are designed to underline a minimalist or slow living decor and come in pale grey, dark grey or a mixed concrete finish. 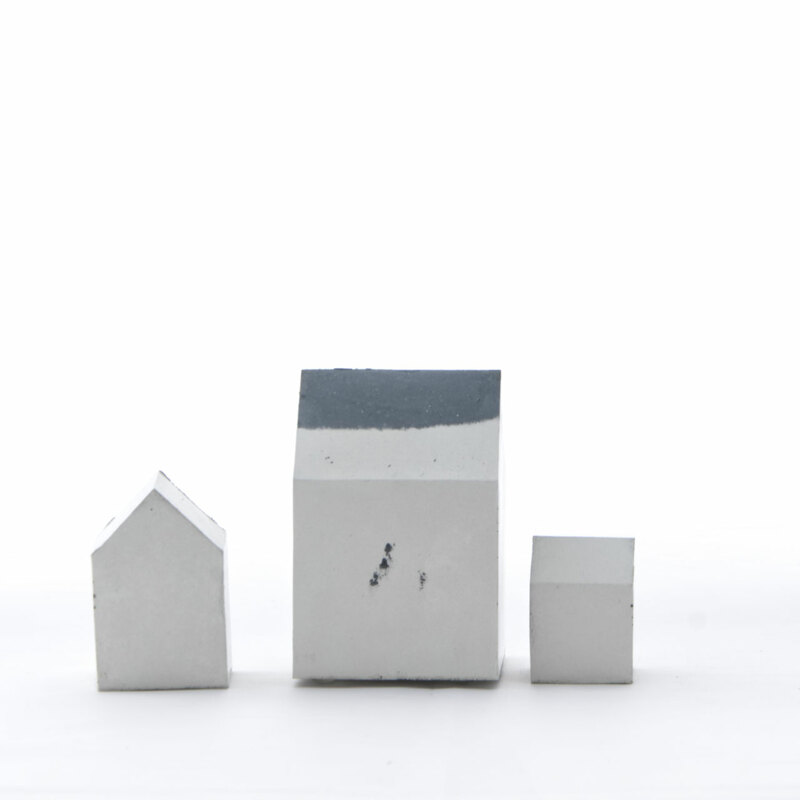 The set displays wonderfully on its own, beautiful when grouped with other artworks or photo collections or added to terrarium displays. 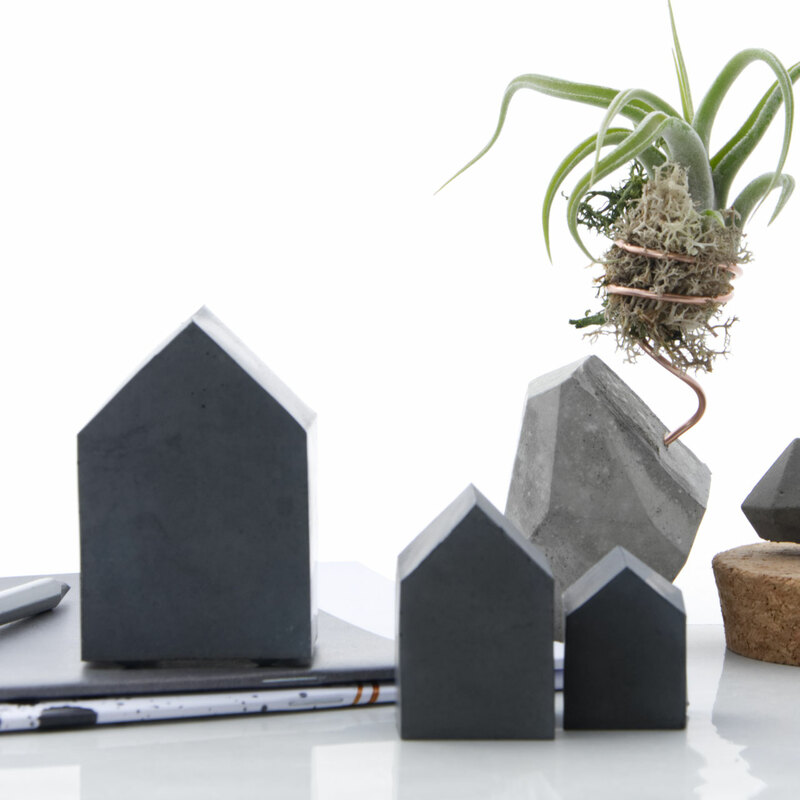 And yes, it is just a great birthday gift for modern design fans, architects or homemakers. 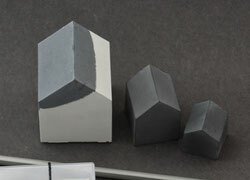 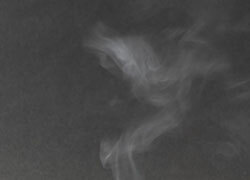 Color: charcoal to dark grey set [picture 1], mid to pale grey set [picture 2], mixed set [picture 3] - please choose your finish below, thank you! 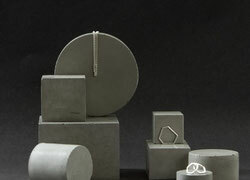 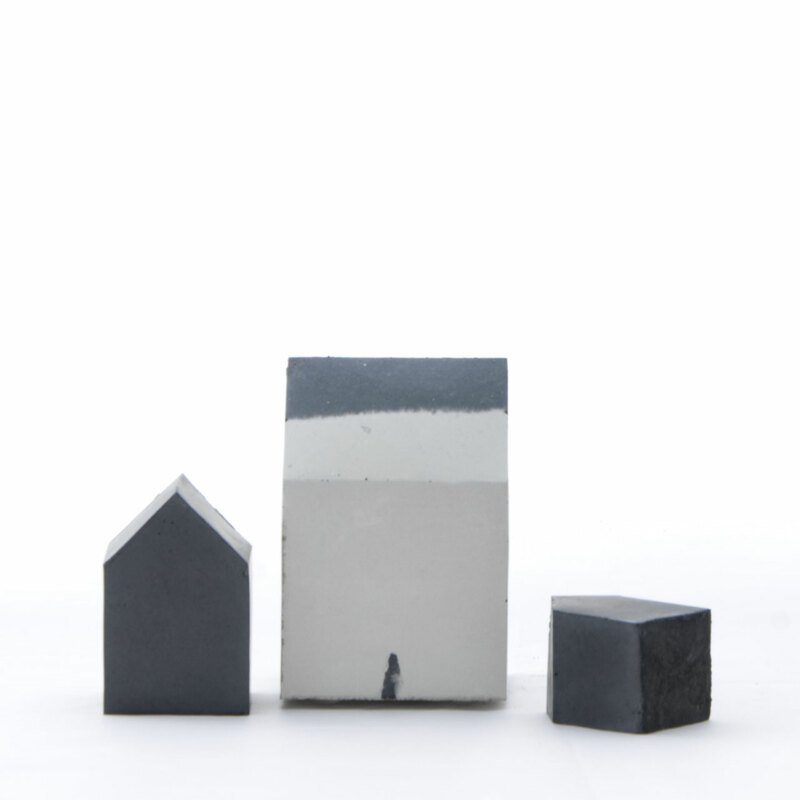 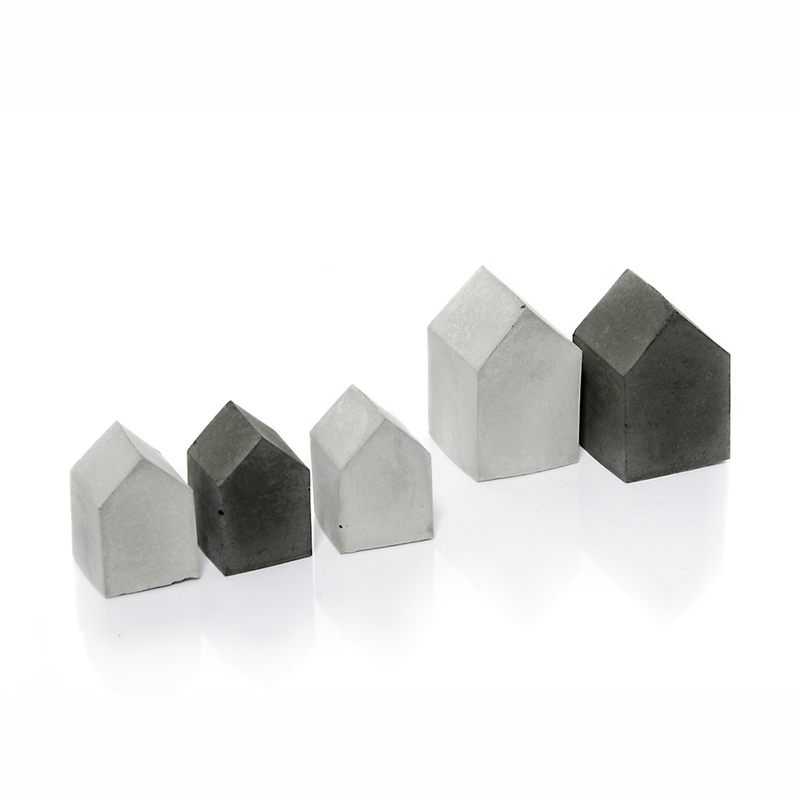 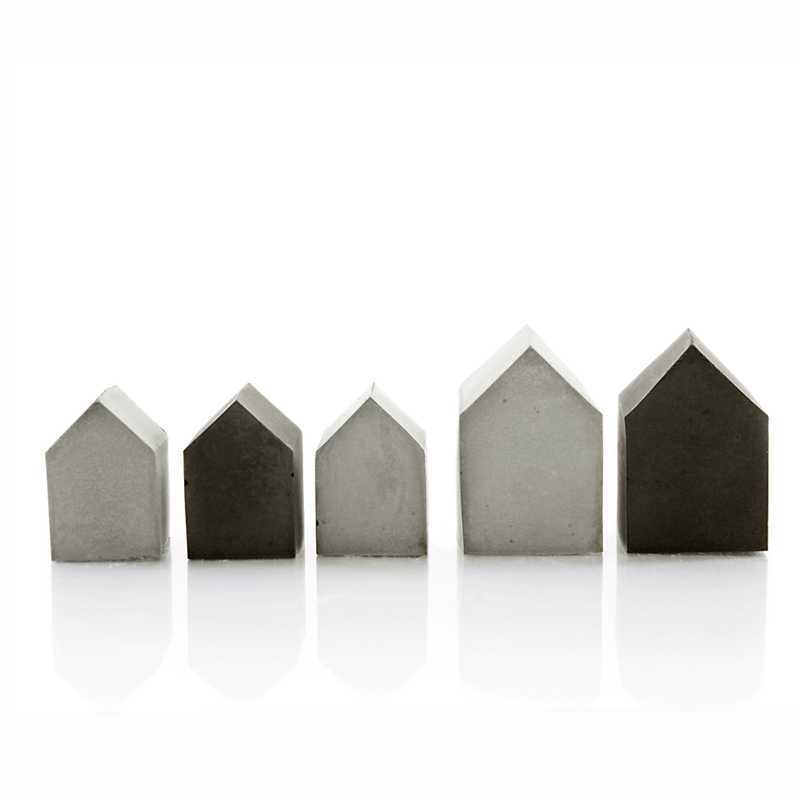 This quirky concrete house collection of five Scandinavian inspired mini houses are just wonderful to decorate with. 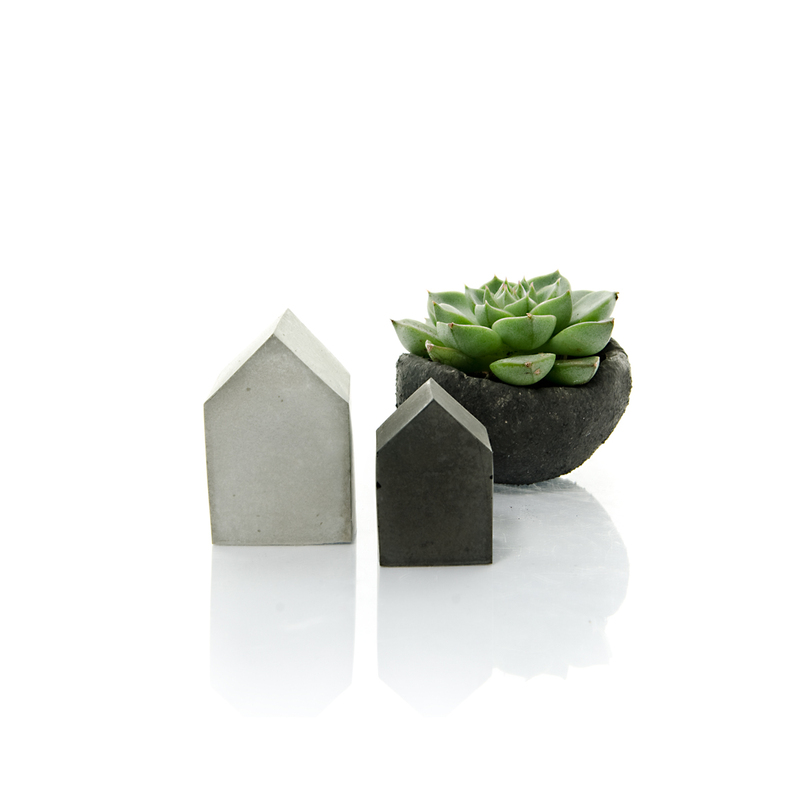 They are easily incorporated into a table setting for Easter or in terrariums. 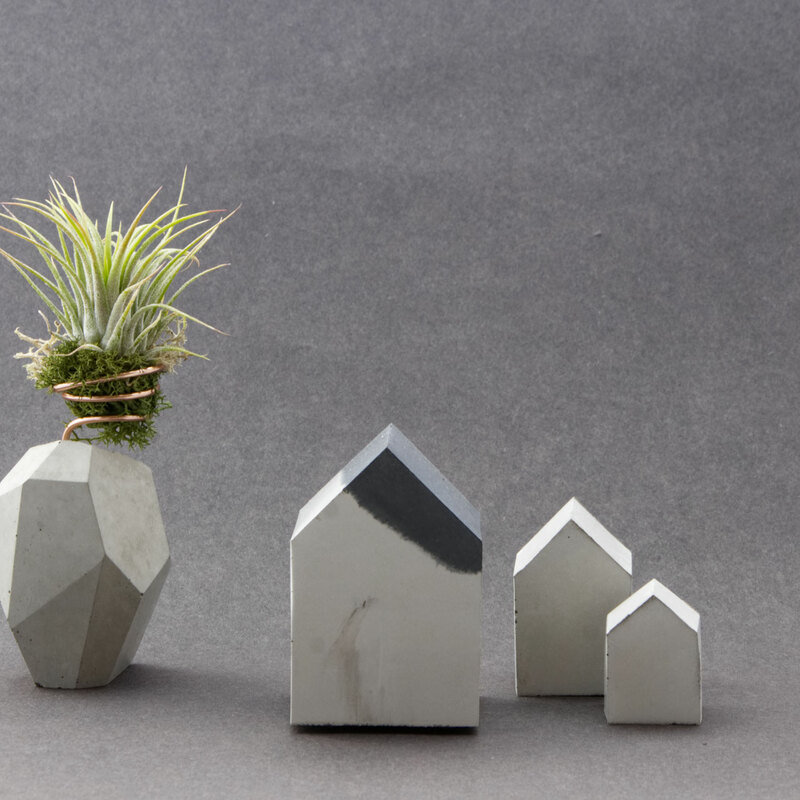 They also display well on their own or on a coffee table or sideboard. 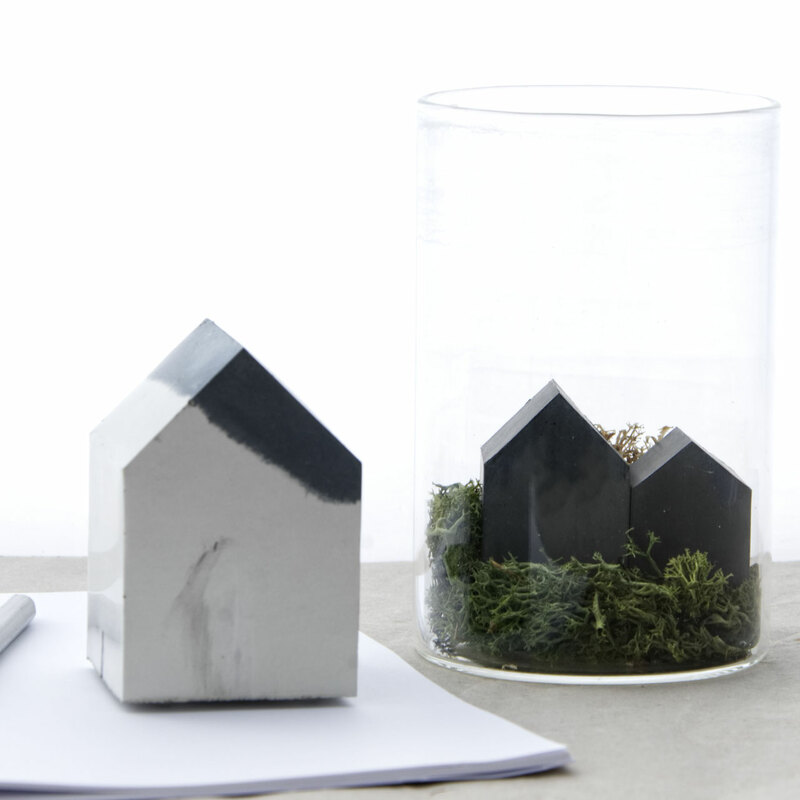 They are offering a very minimal yet hygge vibe and always seek attention to be talked about. 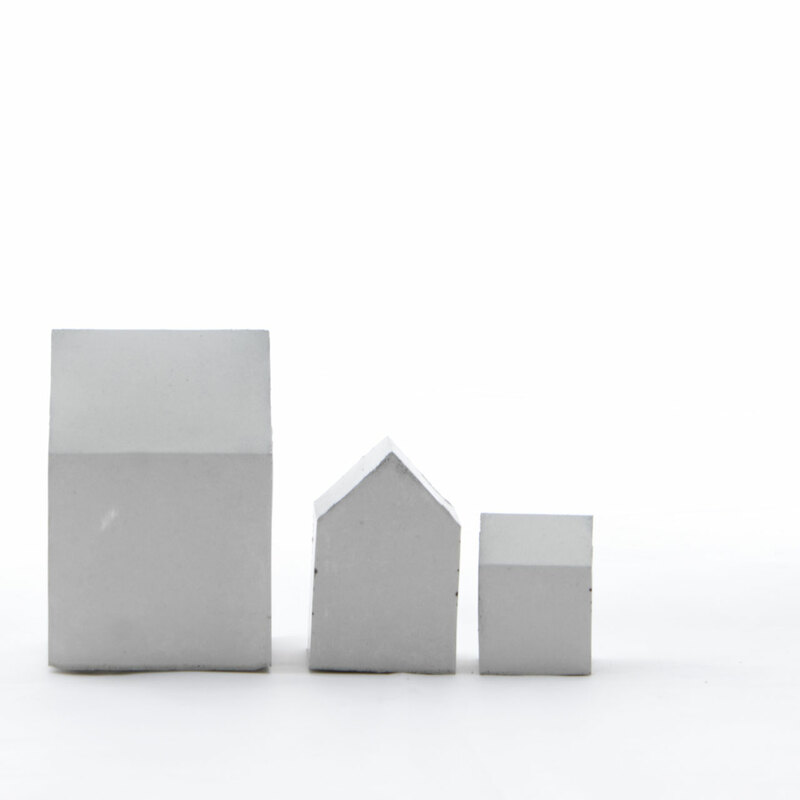 Each is individually hand cast and finished uniquely due to the raw nature of the material. 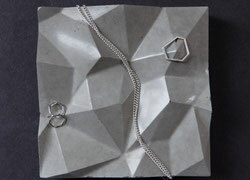 Indulge yourself or give it as a thoughtful gift! 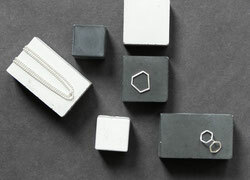 psst .. the set of two is available as well, just have a look above, enjoy! 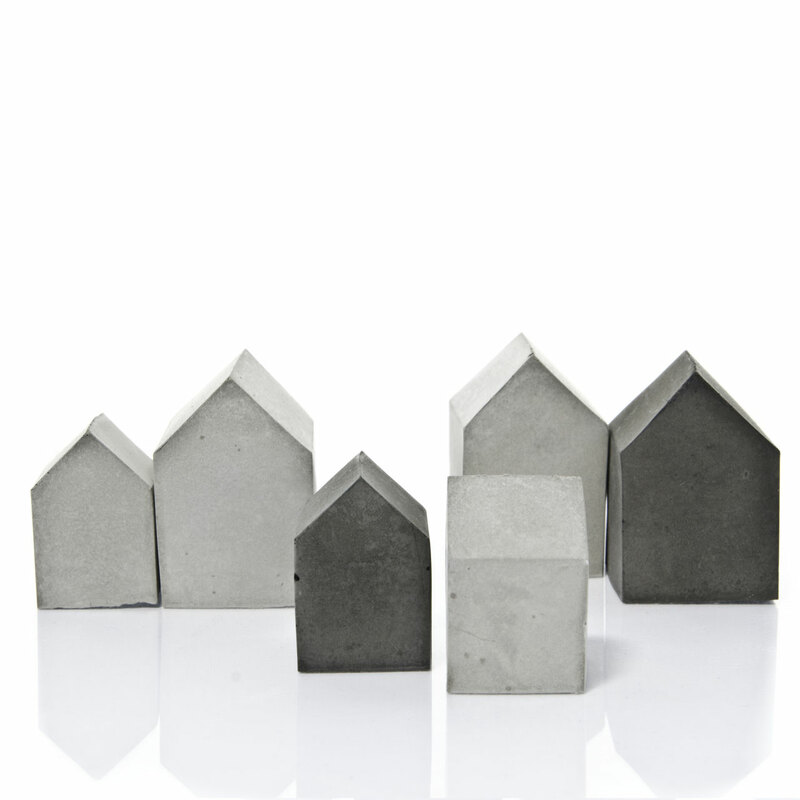 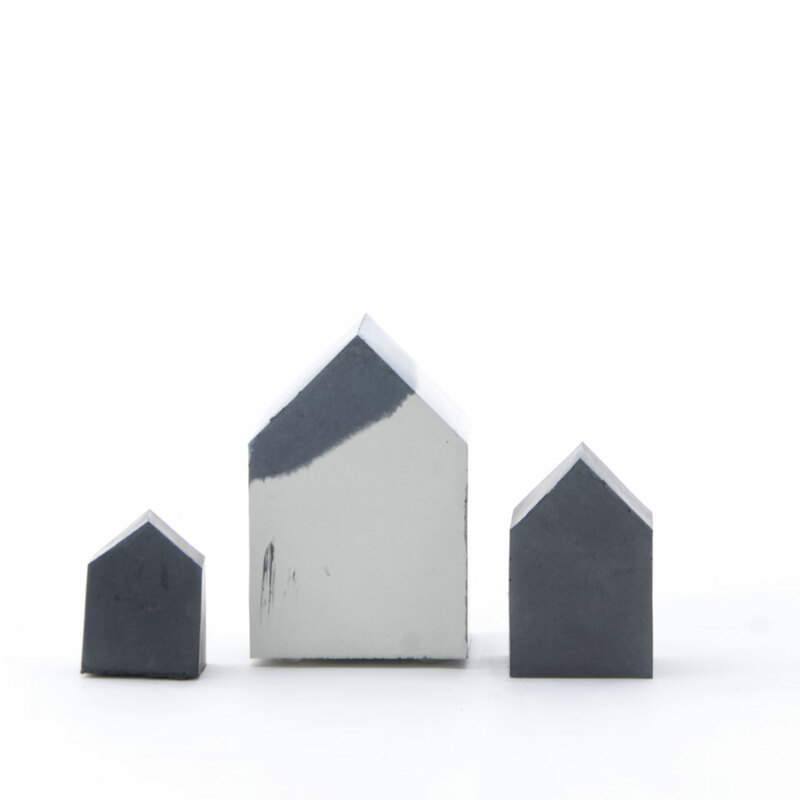 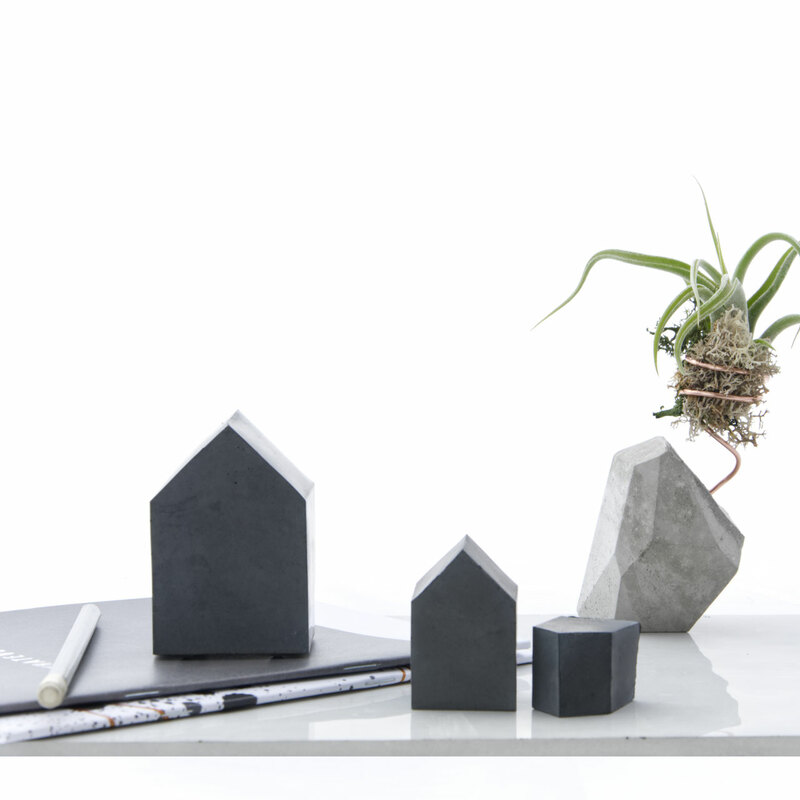 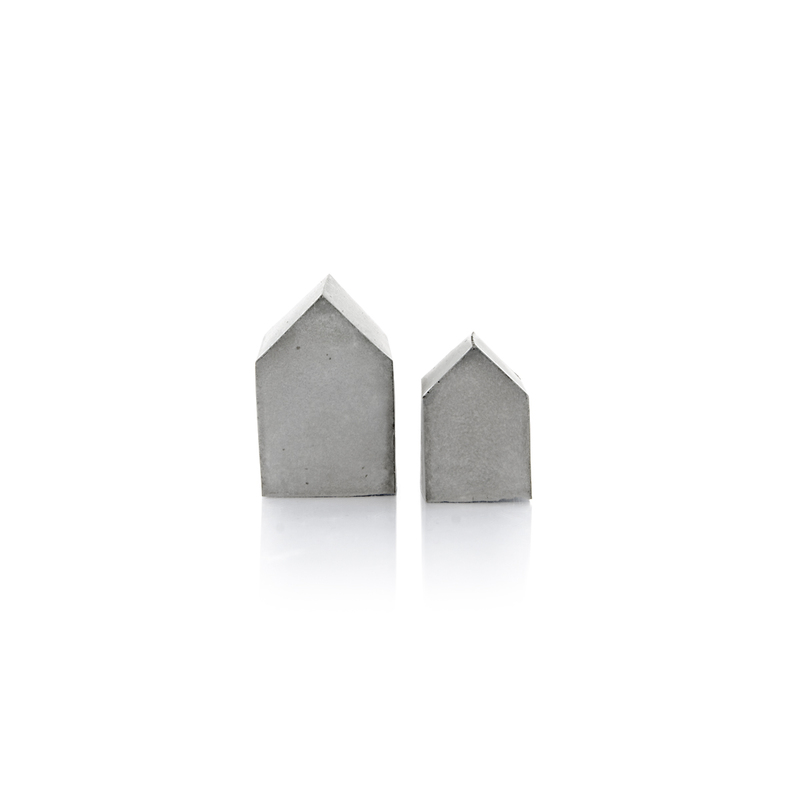 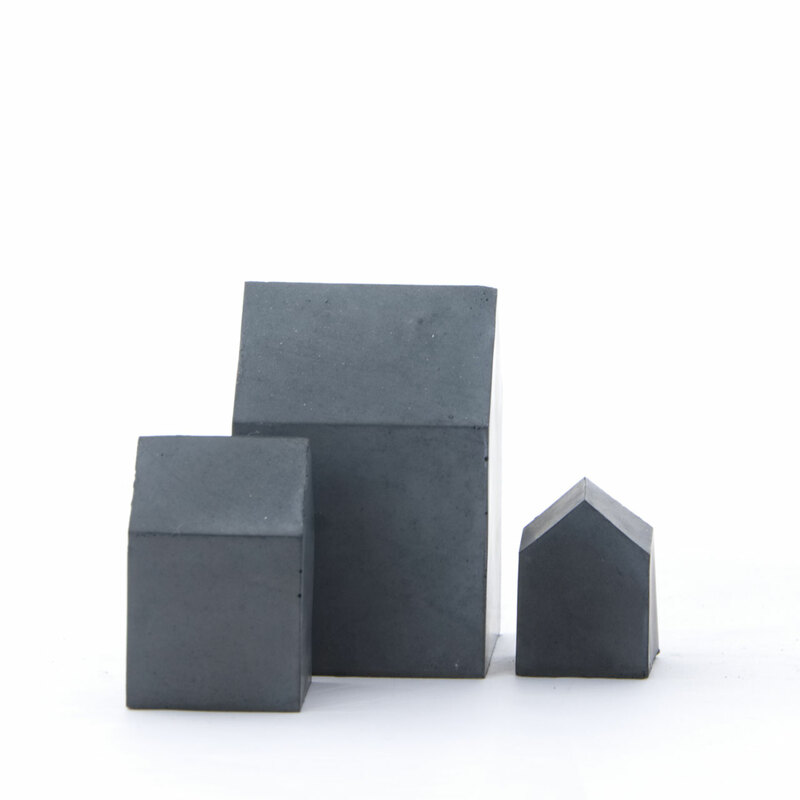 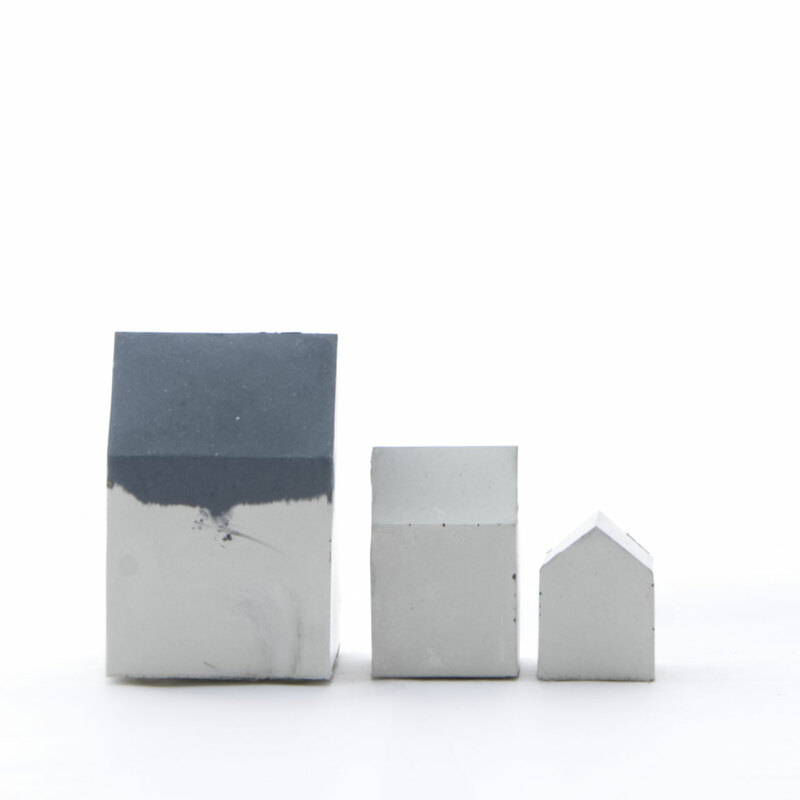 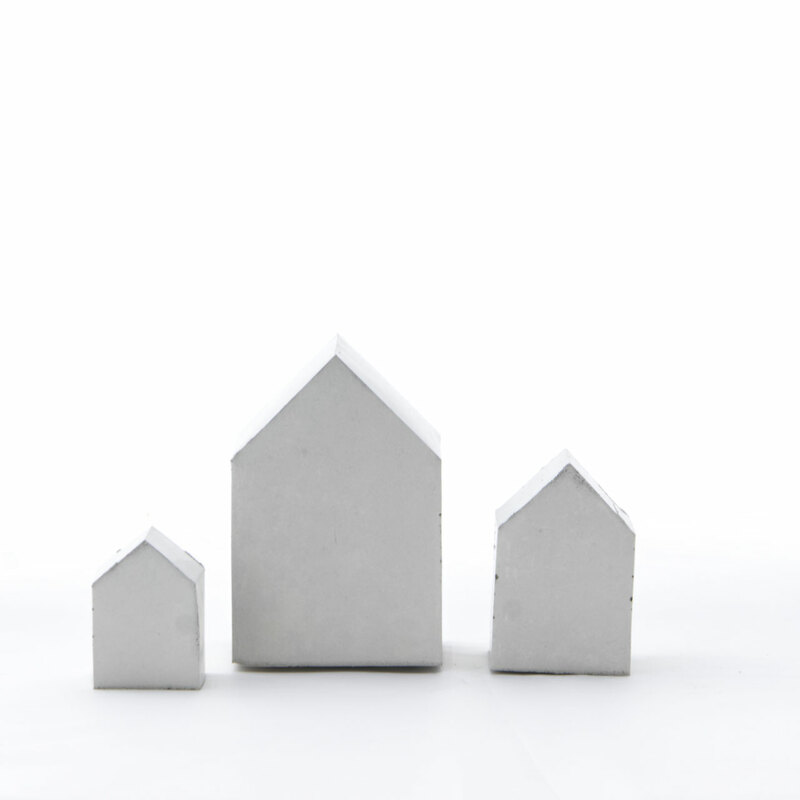 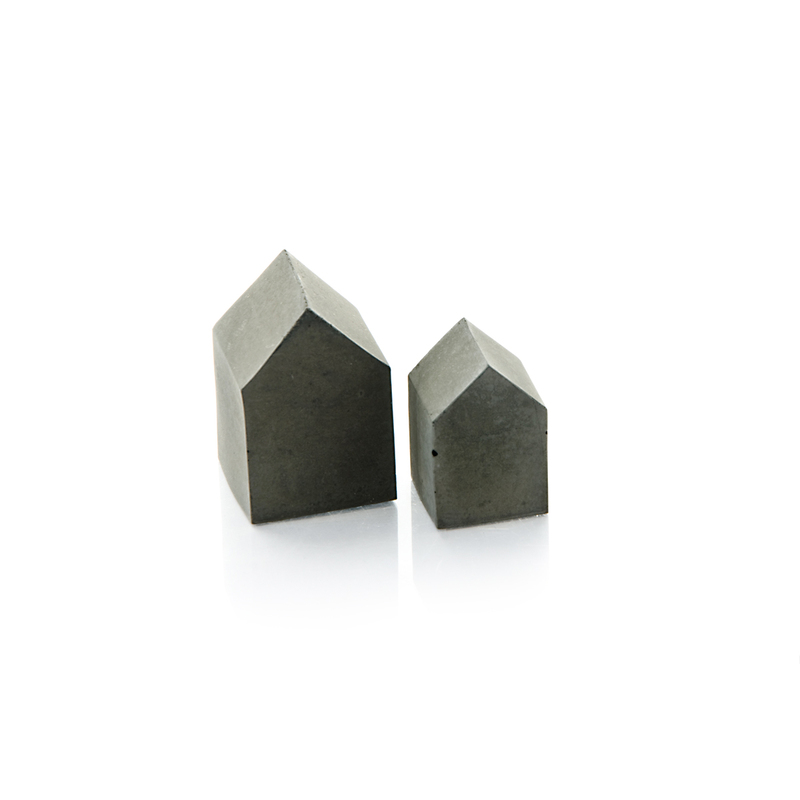 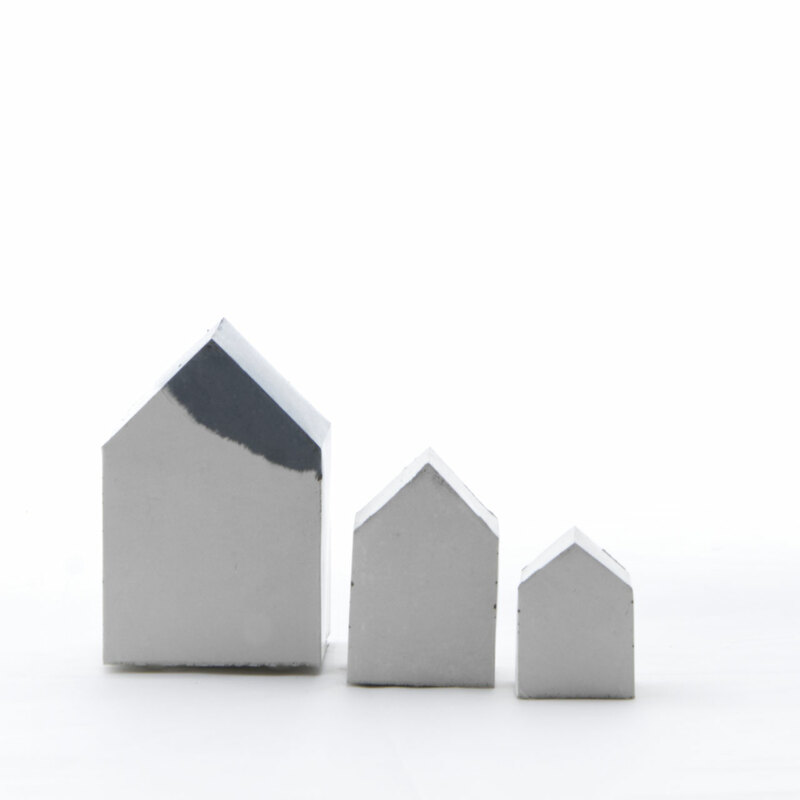 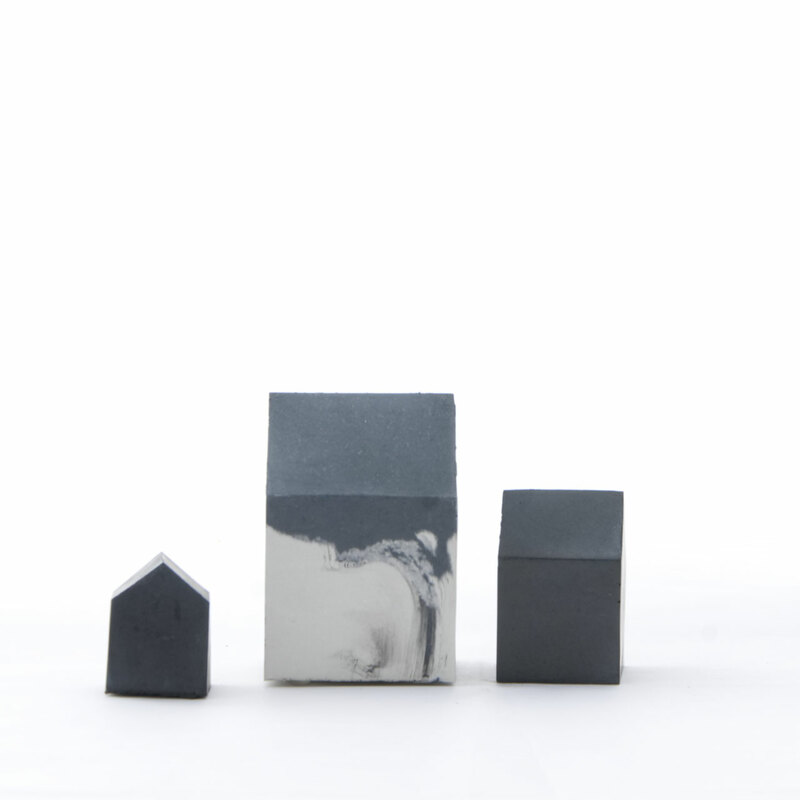 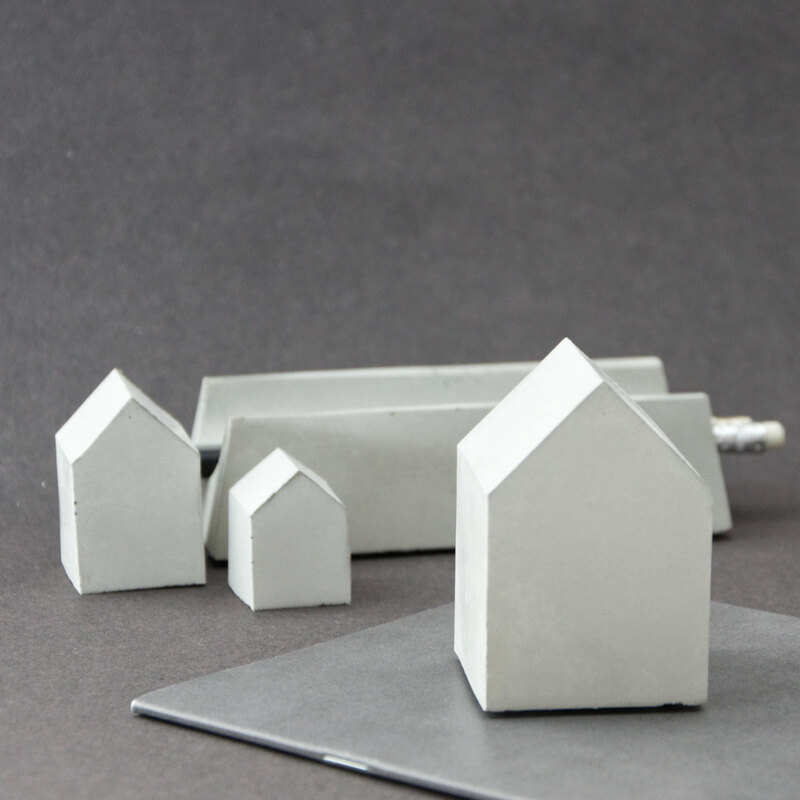 A modern concrete Scandinavian inspired house shaped paperweight sculpture finished in pale or dark grey concrete makes just the right office accessory to create a little happy place. 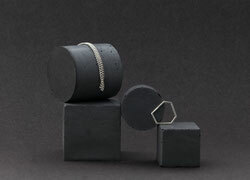 But of course it is also a wonderful gift and it does also display well on its own as a minimal sculpture set on a sideboard or coffee table. 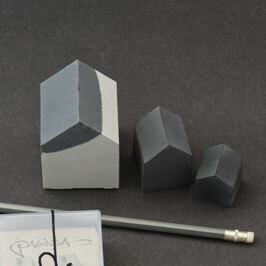 It comes with the option of just choosing the paperweight or to go for a decorative sculpture set of 3 but all of them are very tactile and come with an unique finish due to the raw nature of the material. 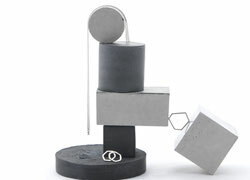 If you have a different set combination in mind feel invited to get in touch! 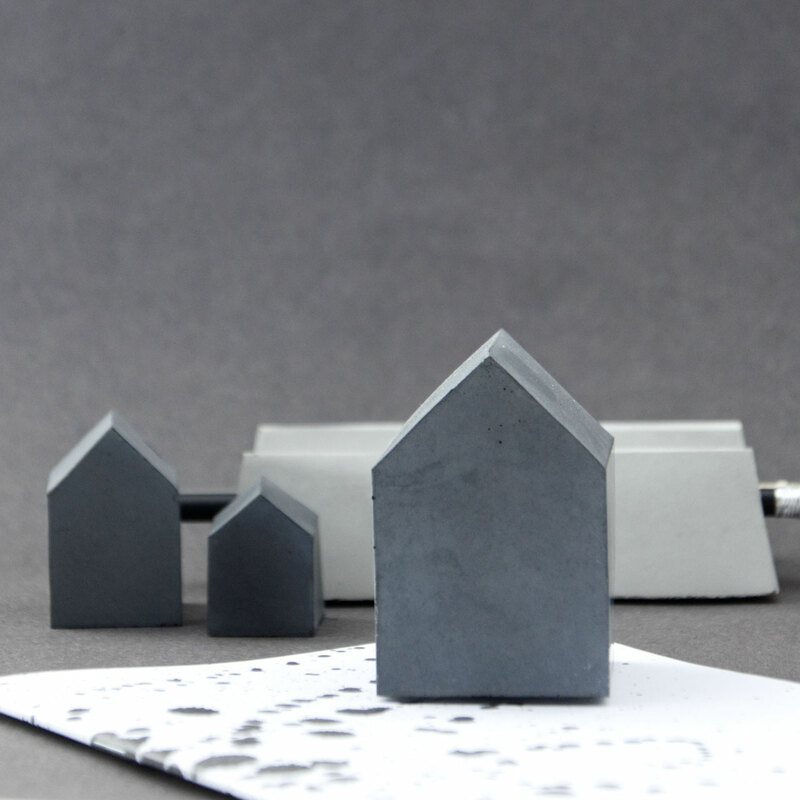 The stunningly imperfect graffiti art inspired house sculpture is a unique beauty on its own and can be utilised as paperweight. 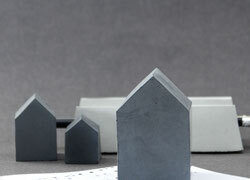 The pale and dark grey concrete mix finishes differently every time in its pale to dark grey effect not to mention the ever changing finish of the raw concrete. 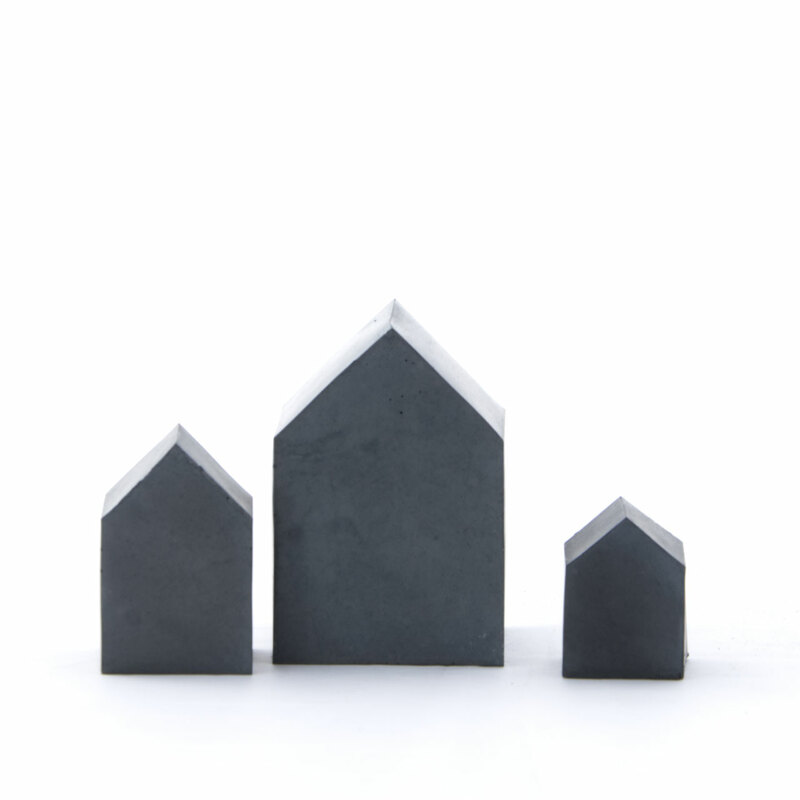 The abstract house sculpture displays well on its own but could be completed and draw even more attention when displayed in a set of three. 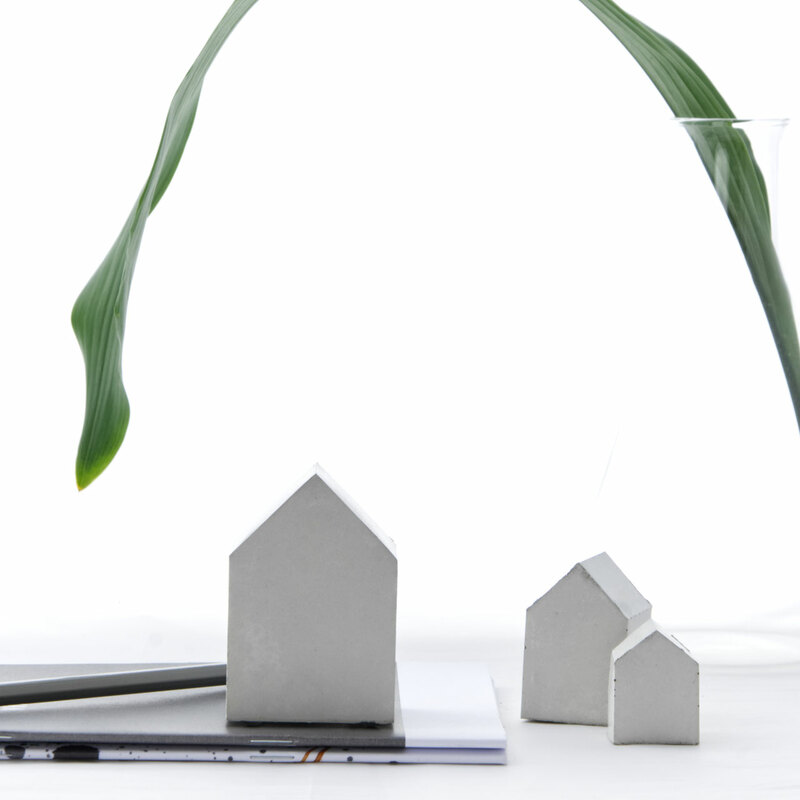 May the decorated pictures be of inspiration. 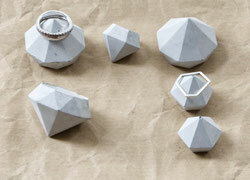 Indeed, this is the perfect gift for design lovers, home makers and art fans!